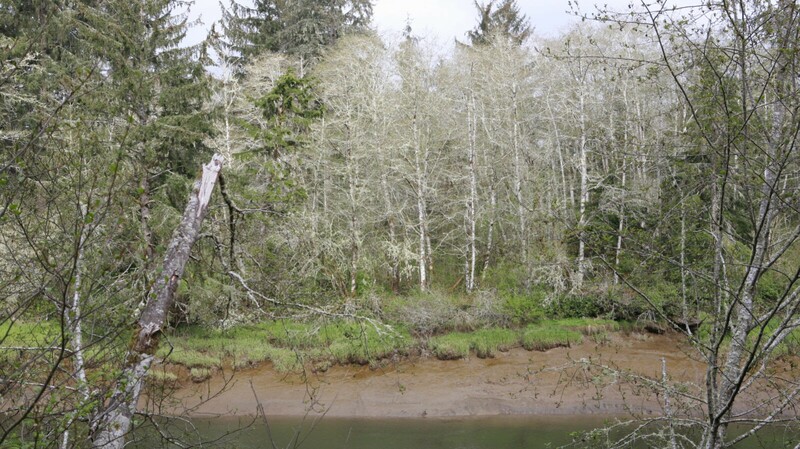 29 acres along the west bank of the Wishkah River in southwest Grays Harbor County near Aberdeen, WA. The property consists of old-growth spruce and cedar in a surge plane habitat. It also encompasses approximately ½ mile of forested Wishkah River shoreline, tidal estuarine habitat, uplands and off-channel habitat. Conserved lands provide habitat for salmon as well as other anadromous fish, black bear, elk, deer, heron, bald eagle, migratory and resident birds and waterfowl, and other species that reside specifically in tidally influenced-riparian/surge plane habitat. Conserve marine estuaries and shorelines. Frank Baretich donated a conservation easement on his land at a slow-moving bend of the Wishkah River, just upstream from the mouth of the river near Aberdeen. On the highest tides, the river surges into wet meadows and old spruce forests, creating a dynamic landscape. This easement represents Capitol Land Trust’s first project in Grays Harbor County, and an unparalleled opportunity to protect a tidal wetland forest – a unique, rare habitat. Tidal freshwater wetlands provide key benefits by protecting coastal lands from storm surges and coastal erosion, filtering out sediments, and sequestering nutrients. They form on lands with low topographic relief adjacent to coastal rivers, such as the Baretich Conservation Easement. The wetlands are influenced by tides, with a pulsed flooding cycle. Unlike most tidal wetlands (such as salt marshes), the water in sitka spruce tidal forests is predominantly fresh. This results in one of the most productive wetland systems on the planet, receiving the benefits of a high energy system and influx of nutrients, without the stress of high salinity found in saltwater tidal systems.